GET READY for a crisp, juicy crop of New England apples this fall as the region’s orchards move into the 2011 fresh harvest. Harvest officially launches on New England Apple Day September 7 (see below). New England expects a good apple crop this year, with strong color and flavor, and a wide range of sizes. The 2011 crop is estimated at 3.67 million 42-pound boxes, an increase of nearly 10 percent over the 2010 harvest, but more than 9 percent smaller than the six-state region’s five-year average of 3.89 million boxes. Maine and Massachusetts expect significant increases from a year ago, while Vermont, which experienced heavy hail damage in the northern part of the state, will be down by more than 25 percent. The timing of the crop is about normal, meaning that McIntosh, the region’s leading variety, should be available for picking in southern and central New England around September 10, a few days later in northern areas. Early varieties like Gingergold and PaulaRed (see below) are already being harvested. CONNECTICUT: The 2011 estimated crop of 550,000 boxes is 13 percent higher than the five-year state average of 488,000 boxes and roughly even with 2010’s harvest of 548,000 boxes. MAINE: Maine expects a crop of about 880,000 boxes in 2011, 11 percent higher than the state’s five-year average of 810,000 boxes and 19 percent higher than the 738,000 boxes harvested in 2010. MASSACHUSETTS: The predicted 2011 crop of 1,050,000 boxes is 19 percent higher than the 881,000 boxes harvested in 2010, and 15 percent above the five-year state average of 914,000 boxes. NEW HAMPSHIRE: The estimated 2011 crop of 524,000 boxes is 5 percent higher than 2010’s 500,000, but 27 percent below New Hampshire’s five-year average of 717,000 boxes. RHODE ISLAND: Rhode Island expects to harvest 67,000 boxes in 2011, up 8 percent from 2010 (62,000 boxes), and 17 percent above the state’s five-year average of 57,000 boxes. VERMONT: Vermont’s estimated crop for 2011 is 600,000 boxes, down 28 percent from the 833,000 boxes harvested in 2010 and 35 percent below the state’s five-year average of 919,000 boxes. The 2011 United States apple crop is expected to be about 3 percent larger than the 2010 harvest, according to USApple’s annual forecast. The 227,519,000 boxes forecast for 2011 is roughly equal to the five-year U. S. average of 226,441,000. New York predicts a crop of 30,000,000 boxes in 2011, down 1 percent from a year ago and 3 percent below the state’s five-year average. Michigan, at 26,100,000 boxes, will be up 86 percent from 2010’s small crop, and 38 percent above its five-year average. Washington, the nation’s largest apple-growing state, estimates a slightly smaller 2011 crop than a year ago at 129,634,000 boxes, about even with its five-year average. NEW ENGLAND’S THIRD ANNUAL APPLE DAY to celebrate the kick-off of the 2011 fresh harvest will be held Wednesday, September 7, in all of the New England states except Connecticut, which will hold its Apple Day Friday, September 2. The Commissioners of Agriculture in each of the New England states will be visiting orchards on Apple Day to meet with growers, learn about the new crop, and bite into a fresh apple straight from the tree. Look for more details in next week’s post. THE BEAUTY OF PAULAREDS, like many apples, is enhanced with distinctive lenticels dotting their skin like freckles. Lenticels assist the apple with respiration, conducting the interchange of gases between the interior tissue and surrounding air. PaulaReds are an early season apple, known for their firm flesh and sweet-tart flavor, with just a hint of strawberry. PaulaReds are good for both cooking and fresh eating, and should be eaten soon after picking, as they do not keep well. PaulaReds were introduced in Michigan in 1968, and grower Lewis Arends named the new variety after his wife, Pauline. It came from a chance seedling and may have McIntosh in its parentage. Here is a nutritious, easy-to-make summer dessert or snack adapted from USApple that features PaulaReds. Preheat oven to 425º. Lightly grease 14-inch pizza pan. Press dough into pan. In a medium saucepan, cook apples and cider until tender. Drain off juice and reserve. Arrange apple slices on dough. Whisk cornstarch into reserved liquid, and add cinnamon and honey. Cook over medium heat until clear and spread over apples. Sprinkle pecans on top. Top with cheese. Bake for 15-20 minutes. NEW ENGLAND APPLE ASSOCIATION has a new phone number: 203-439-7006. 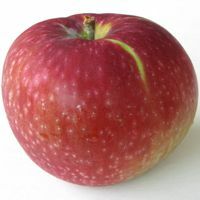 For more information about New England apples, visit newenglandapples.org or give us a call!